PB 22 - Fastest mobile printer! With the fastest time to first label, the rugged PB22 printer is ready to ramp up productivity in the most demanding retail or warehouse environment. 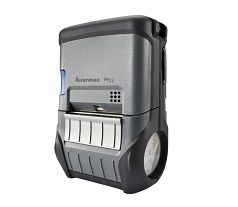 This reliable 2 inch label printer integrates seamlessly with Intermec mobile computers and software to deliver high performance printing while lowering the cost of development, deployment and support.The Intermec rugged mobile label printer family delivers the fastest choice for customers with demanding applications.